Recall a favorite line from a beloved book. Its resonance and its transcendence recall something of the fragile tenacity of the human spirit–in a smudge of ink on grainy paper. A writer is a patient warrior in a never-ending battle of thought. Think of the rivers of ink spilled by all those playwrights and poets so that, in glory and triumph, they could become the momentary masters of our hearts and our wits. Think of the intellectual cruelties visited by the inhabitants of one philosophy on the inhabitants of another, how biting their criticism, how fervent their satire. Our histories, our freedoms, our collective wisdom, our potential as a species are borne by the writer. A sentence is but a sword, sometimes never drawn, that guards the secrets of humanity. In its solemn immortality, the sentence imbibes the life of its smith and its conscript, its form solid but its meaning malleable. The writer is entrusted with the preservation of thought and being. There is no one else, in our human history, who can so precisely and delicately capture the essence of human life. Like it or not, the writer’s craft transcends the limitations of the senses that constrict other arts. It has been said that “the purpose of literature is to turn blood into ink” (T. S. Eliot). There is perhaps no better demonstration of the power of the written word than this single sentence you have recalled. To me, it underscores the universality of our human experience and our calling to preserve and cherish this art, the only home we’ve ever known. What you read above is simply a first draft, written in about 20 minutes, with minimal planning or preparation. Sure, you might say, it’s easy for an English teacher to whip out something coherent–but high schoolers? Surely not. Think again. The power of the mentor text is that it forces students to THINK through the first draft and refine in the subsequent drafts. They have structures with *just enough* flexibility to be original, but the focus is on their ideas. The italicized text above is from my favorite mentor text exercise, based on Carl Sagan’s “A Pale Blue Dot.” I show the video, give students a copy of the text, and set them to writing about a topic. Sometimes I assign it, sometimes they choose. Sometimes I give them a sentence-by-sentence breakdown of what they should have in each paragraph; ideally, though, they will be able to adapt each sentence from the mentor text to their own style and content. 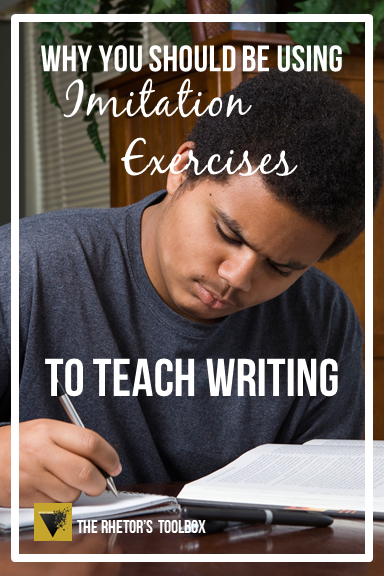 While I ask students to write imitating this entire text, it’s easy to use imitation exercises on a sentence or paragraph level. Check out Nancy Dean’s Voice Lessons and Sullivan & Longknife’s The Art of Styling Sentences for some curated mentor texts and structures. Have students keep an index of “golden lines” from their readings. Use student exemplars as mentor texts for other students to imitate. Get them writing with a focus on ideas first, and let the experts lead them to sophistication.